14/11/18 Walter Cardew Group will appear at Klinker Club in London. Click here for details. 17/11/17 Walter Cardew Group will appear at Klinker Club in London. Click here for details. First performance for new line-up including Horace Cardew (bass clarinet), Paul Taylor (trombone), Androniki Liokoura (keyboard), Walter Cardew (electric guitar). Saturday 7th November 2015; 12 noon, live set at South Norwood Methodist Church as part of South Norwood Arts Festival. Saturday 19th September 2015; 12 noon, live set at Stanley Halls as part of their participation in London Open House. 4/2/15: New release: new CD release by Sabrina: Study for Three Demonic Dances. Details here. 14/1/15 Coming soon: Italian record company Elica will be releasing a Walter & Sabrina greatest hits record on Vinyl LP. More news soon. Walter Cardew Group on the radio: Friday 4th April 2014, 2-2:45 pm, Resonance 104.4 FM. More details here. 4/1/13 Available soon: a newly set edition of Vietnam Sonata (solo piano) by Cornelius Cardew. Click here for all Cornelius Cardew publications on Danny Dark Records. 4/1/13 Recording is now finished for the forthcoming Sabrina publication now to be called DEMONS II. Click here for more info and links to artwork from the accompanying book. The picture below was taken at the final session. 25/11/12 Review of Chamber Music by Walter Cardew Group in Bad Alchemy (in German) here. Walter Cardew Group on the radio: Friday 16th November on the ABC (Australia's national broadcaster) programme Sound Quality presented by Tim Ritchie. Broadcast at 11:20 pm (local time) and available now as a podcast. Also featuring Brian Eno's new CD. Click here for Sound Quality's page with podcast and playlist. Walter Cardew Group on the radio: Tuesday 30th October and Friday 2nd November on RAI's (Italian national radio) Battiti (0000-0130 local time). Playlists are here. Podcasts are available here. Battiti is broadcast each weekday night on RAI Radio 3. - UPDATE and more on Monday 12th November! 28/10/12 To commemorate the launch of Chamber Music by Walter Cardew Group we are making available the score for Solo 56 for electric guitar as a free download, either as a double-sided sheet of A3 or as 4 sides of A4. Go to our Walter Cardew Publications page here. The music by Walter Cardew Group will be in the second half of the show. 4/10/12: Preview of forthcoming Walter Cardew Group CD Chamber Music by Massimo Ricci here. 19/8/12: In October we will release the debut CD by Walter Cardew Group called Chamber Music. More information here. 27/2/11: Walter & Sabrina on the radio: in the company of Messiaen and Robert Wyatt amongst others. Apparently broadcast on Thursdays at 8pm (USA Pacific time) and repeated at the same time on Saturdays. 1/8/10: Click here to see some more rough images from the forthcoming Demons Art Book by Sabrina for release in 2013. 21/10/09: Walter & Sabrina on the radio: Italy: Hear an excerpt from Two Tales on Nicola Catalano's Battiti show on RAI-Radio 3, Wednesday 21st October between 00:00 - 01:30 CEST (23:00 - 00:30 BST). You should be able to listen over the internet from here. 8/10/09: Read Nicola Catalano's review of Two Tales in Blow Up - if you can read italian! - here. audio CD, colour booklet and book: this is the FINAL release by Walter & Sabrina. buy it here. Read Mike Wood's review here. Walter & Sabrina on the radio: Friday 11th September 11.20 pm AEST (NB 2.20 pm BST): Tim Ritchie's Sound Quality show on Australia's ABC. Walter & Sabrina Play Classical, Tale One from Two Tales will be featured in the first part of the programme. Listen live on the internet here. The program also lives for 4 weeks after broadcast as on demand listening, from an hour after the broadcast, go here and click on "Listen Now" for the program dated 11 September. Thursday 2nd July 2009 at 11am: Walter Cardew, Horace Cardew and Celia Lu will be performing as part of the opening of the Drawing Room's From Scratch event. Click here for details. Monday 29th June: Walter Cardew/Sebastian Lexer and others at Cafe Oto, 18-22 Ashwin Street, London E8 3DL. Click here for more details. Sunday 3rd May 11am-12 noon: Walter Cardew live on Forty Years from Scratch on Resonance 104.4fm. Live music including a new composition based on a Christopher May piece in Scratch Music for Tom Chant, Horace Cardew, Celia Lu, Mizuka Yamamoto and Walter Cardew. Walter Cardew and Mizuka Yamamoto will play a duet for electric guitar and violin. Walter Cardew, Celia Lu & Mizuka Yamamoto will also play some Walter & Sabrina songs. 21/3/09: Recording is complete for the new Walter & Sabrina release. Featuring Laura Pooley, Gunnar Brandt-Sigurdsson, Celia Lu, Dai Pritchard, Horace Cardew, Matt Dungey, Androniki Liokoura and others. Click here for stills from the sessions. 4/3/09: Walter Cardew and Celia Lu will play some Walter & Sabrina songs at Fixyrfayceparty in the Dogstar in Brixton, London, Friday 6th March from 8pm. 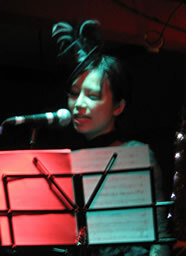 25/2/09: Walter Cardew will join Mizuka Yamamoto for one item in her concert at Goldsmiths College in London on Monday March 16th. The concert will include new works by Walter Cardew, Rick Campion and Alistair Smith as well as Boulez' Anthèmes for solo violin and Sequenza VIII for solo violin by Berio. Venue: Great Hall, Goldsmiths College, University of London, New Cross SE14 6NW. Click here for Goldsmiths' concert diary and scroll down. 25/2/09: The complete Walter & Sabrina catalogue is now available from SOUNDOHM/DIE SCHACHTEL in Milan (www.soundohm.com). Click here for Walter & Sabrina and here for Walter & Sabrina/Dietrich Eichmann Ensemble. 23/2/09 We have a limited number of a new book by Tyrus Miller called Singular Examples. Click here for details. 3/11/08: Massimo Ricci in Paris Transatlantic on Jung Ahh Fleisch and Demons! on our review pages here. 3/11/08: Walter & Sabrina/Dietrich Eichmann Ensemble on the radio: hear Walter Cardew, Celia Lu and Mizuka Yamamoto play some live Walter & Sabrina songs as well as tracks from Jung Ahh Fleisch and Demons! on Sound Out on Resonance 104.4 fm; 2-2:30 pm on Friday 7th November. 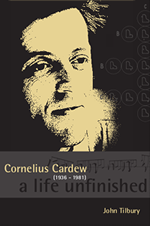 John Tilbury's book on the life and work of Cornelius Cardew, A Life Unfinished, is now available from matchless records here. To commemorate its publication we are making available 2 new scores: We Sing For The Future for solo piano (never previously published) and a new edition of Worker's Song for solo violin. Go to our Cardew publications page here. Also, a very limited number of Frederic Rzewski's New Albion CD of "We Sing For The Future!" here. 15/10/08: David Keenan doesn't like us... see what he has to say in the November edition of The Wire here. 8/10/08: Walter & Sabrina on the radio: Italy: Hear tracks from Jung Ahh Fleisch and Demons! on Nicola Catalano's Battiti show on RAI-Radio 3, Wednesday 8th & Thursday 9th October between 00:00 - 01:30 CEST (23:00 - 00:30 BST). You should be able to listen over the internet from here. 1/10/08: Rigobert Dittman has reviewed Jung Ahh Fleisch and Demons! in Bad Alchemy 60 - see our reviews page for a pdf of the original. Australia's "Sound Quality" has broadcast "Tortured Pets-Sammy's Bloody Eye" from Demons! by Walter & Sabrina/Dietrich Eichmann Ensemble - click here to listen to the programme (#37 12th September 2008). Estonian national radio: "Gazza Knows Best" from Demons! will be played towards the end of the one-hour show Nyyd-muusika, subtitled "Sports and Musics", 21:00-22:00 EEST (19:00-20:00 GMT) on September 16th on Klassikaraadio. Listen on the internet here. The on demand stream link appears around an hour after broadcast. 13/9/08 Read Mike Wood on Jung Ahh Fleisch here. 20/8/08: Walter & Sabrina on the radio: Mundo Bizarro on Radio Universidad in Mexicali, Baja California, Mexico. 8/8/08: Walter & Sabrina on the radio: Jung Ahh Fleisch featured on Nash Rose's show on New York's WFMU. You can listen via the Nash Rose page. 17/7/08 JUNG AHH FLEISCH is now available. Click here for details. Click here to buy. 14/7/08 We are very pleased to be able to make available a selection of titles from Oaksmus records. Oaksmus is run by Dietrich Eichmann with whom Walter & Sabrina have been collaborating. The catalogue includes composed and improvised material by Eichmann and his ensemble (including the excellent "hot Days" CD) as well as others. Click here for the catalogue. 4/7/08 Limited edition booklet of Demons! lyrics available. Also, stills from recordings and performance in Berlin with Dietrich Eichmann Ensemble. 8/6/08 Walter & Sabrina on the radio: wfmu in New York ("fantastic website, great archives. It is truly eclectic programming..." Matt Groening, Simpsons Creator) have been playing tracks from "We Sing For The Future" on two of their shows: Inflatable Squirrel Carcass with Rich Hazelton - April 20, 2008 & Pseu Braun - April 18, 2008. Check them out here. 16/2/08 We Sing For The Future and our Taster disc are both reviewed in January's issue of the US publication Bixobal. See our reviews page for an excerpt. 6/1/08 Walter & Sabrina on the radio: Walter & Sabrina make it into NYC's free103point9's Top 40 for December. 27/12/07 Read Mike Wood in Foxy Digitalis on We Sing For The Future from here. 18/12/07 Read Rigobert Dittman on We Sing For The Future from Bad Alchemy 56 here. 8/12/07 Read Massimo Ricci on We Sing For The Future here. 6/12/07 Read Nicola Catalano's article on Walter & Sabrina from October's Blow Up magazine here. 6/12/07 See jpegs of recent articles on Walter & Sabrina in October's Wire magazine here, and Rock a Rolla here. Click here for details and stills from the performances. Webstore for experimental music, improvisation, avantgarde composers music and unusual rock sounds - including Danny Dark Records. 26/10/07: Walter Cardew will be appearing on Brunch at the Foundry live from the Foundry's bar between 12 and 1pm on Friday 26th October on Resonance fm. Listen here. 18/10/07: Recording has started on a new Walter & Sabrina project. We'll be posting links to photos and other stuff on our contents page. 16/10/07 Oaksmus is a Berlin based distributor run by the composer Dietrich Eichmann and have added Walter & Sabrina to their catalogue of contemporary music. Click here for links to all our outlets. 16/10/07 Walter & Sabrina images on The Wire website: click here to go the their web exclusive picture gallery. Saturday 27th October 2007: We Sing For The Future Launch event. Click here for pics from the event. Downstairs at the Foundry in London as part of disco_r.dance Danny Dark Records will present films by Sabrina including "We Sing For The Future" and a film by Kompleksi /Spul Films. Also live music from Stefano Tedesco's SOLARIS and SKITANJA. Click here for pics from the launch event for We Sing For The Future. 1/10/07 See October's The Wire and Rock-a-Rolla magazines for articles on Walter & Sabrina. The Wire's Web Exclusive also has "From A Distance" available as an Mp3 download. Italy: Hear tracks from "We Sing For The Future" on Nicola Catalano's Battiti show on RAI-Radio 3, Tuesday 2nd & Thursday 4th October between 00:00 - 01:30 CEST (23:00 - 00:30 BST). You should be able to listen over the internet from here. Australia: Friday 24th August 11.20 pm AEST (NB 2.20 pm BST): Tim Ritchie's Sound Quality show on Australia's ABC. Listen live on the internet here. The program also lives for 4 weeks after broadcast as on demand listening, from an hour after the broadcast, go here and click on "Listen Now" for the program dated 24 August, Walter & Sabrina (including a preview of "We Sing For The Future") will be in the first hour. 19/7/07 Hear In Tune With The Infinite's feature on Walter & Sabrina on Australian radio PBS over the internet, 3-5pm BST Sunday 22nd July. Click here and click on "Listen Live". 18/7/07 B&L Records' Cornelius Cardew CDs available here. 11/7/07 Promotional posters for "We Sing For The Future" available here. 9/7/07 We now sell a number of titles by the German company Edition RZ including recordings by Xenakis, Christou, David Tudor and others. Click here for the catalogue. 2/07/07 Read Keith Moliné on "Chioma SuperNormal. The Dark Album" & "Rock 'n' Roll Darkness" in Wire magazine, July 2007 here. 7th July 2007 11am, York University. For those interested in Cornelius Cardew: Aleks Szram will be giving a lecture/recital called "Guiding the Performer: the use of Improvisation in the Octet 61 by Cornelius Cardew and the Third Piano Sonata by Daryl Runswick" as part of the ICMSN 2007 conference where improvisation is the keynote topic. 28/5/07 Mark Russell and Robert Sandall played some of "Rock 'n' Roll Darkness" on their new show on Resonance 104.4 FM "Where's The Skill In That". 20/5/07 Read John S on "Rock 'n' Roll Darkness" here. 14/5/07 Listen to "In Tune With The Infinite" with Lucifer Sam on Progressive Broadcasting Service via the internet here. Create a log-in for yourself and you'll have access to their archived programmes including "In Tune With The Infinite" which will be playing Walter & Sabrina over the next few weeks. Anyone interested in what they call "under-represented" music will find plenty of interesting stuff there. 1/5/07 Read Dan Warburton on "Rock 'n' Roll Darkness" here. 29/4/07 Read Nicola Catalano's reviews of "Chioma SuperNormal" and "Rock 'n' Roll Darkness" here. 2nd May 2007; 7-8pm BST: Walter Cardew will present an hour of music from the Danny Dark Records catalogue on "Clear Spot" on Resonance 104.4 FM. Those near central London should be able to listen on FM, but anyone with internet can listen from their website. The broadcast will include a preview of Walter & Sabrina's new recording of Cornelius Cardew's "We Sing For The Future"
8/4/07 Hear tracks from "Rock 'n' Roll Darkness" and "Chioma SuperNormal" on Italian national radio RAI-Radio3, Monday night 9th April between 00:00 - 01:30 CEST (23:00 - 00:30 BST). You should be able to listen over the internet from here. 14/3/07 Promotional posters for "Rock 'n' Roll Darkness" available here. 9/2/07: 19th March sees the release of "Rock 'n' Roll Darkness"; the new enhanced CD from Walter & Sabrina. Click here for details. 1/1/07 Dan Warburton on "Chioma SuperNormal" in Paris Transatlantic. . .
Danny Dark Records is not currently charging any postage except on Cardew's Great Learning scores. 7/12/06: Hear Walter Cardew "Sound Out", 5pm Resonance 104.4 fm. Coming soon on Music Now will be a recording by Alexander Balanescu and James Green of Cardew's Thälmann Sonata for violinist and percussionist (vibraphone and marimba), recently published by Danny Dark Records. The score for The Great Learning is now available through Danny Dark Records here.